Dovetail Pine's texturing and light gray coloration achieve the look of real hardwood adding beauty to any room. Its durable AC4 wear layer protects against scratching, fading and staining. Appropriate for residential and commercial use, it features a user-friendly locking technology for a quick and easy installation. The Home Decorators Collection Tuscan Stone Bronze Laminate Flooring offers an ultra-realistic stone finish that mimics the surface textures and characteristics of a real stone floor. With a natural look and hues of bronze, copper and browns, this well-crafted floor is ideal for active households and includes the patented Embossed in Register surface texture that precisely positions over the pattern underneath. Premium features include an attached underlayment that saves time and money in addition to reducing noise, extra-large boards to speed up installation and an easy-to-install glueless locking system. Each tongue and groove is fully sealed to help prevent moisture penetration, and the patented Joint Guard technology protects joints from chipping. Home Decorators Collection floors are also FLOORSCORE certified for low-emitting products, providing an environmentally friendly solution for your flooring needs. These 12mm Laminate Planks from Power Dekor feature the hand crafted charm of a chiseled edge border, saw markings, and a hand scraped surface for an unparalleled level of authenticity. This product features a pre-attached 2mm underlayment providing a moisture barrier, sound reduction and an enhanced underfoot feel. These planks have an AC4 wear layer for maximum protection from wear, scratches and stains and are covered by a 25 Year residential warranty. This beautifully crafted 12mm Laminate Flooring from Power Dekor offers the ultimate in style, design and performance in a random width and length plank format. Each box contains 3.5", 5.625" and 7.625" plank widths in various lengths. These strikingly rich wood decors are finished with an embossed in register finish, giving your floor an authentic appearance and underfoot feel. This product features a commercial grade AC4 wear layer for added resistance to wear, scratches and stains. A patented Uniclic<sup></sup> glue less locking system is used to ensure a quick and easy installation. This product can be installed over radiant heat, on, above or below grade and is covered by a 35 year residential warranty / 5 year light commercial warranty. 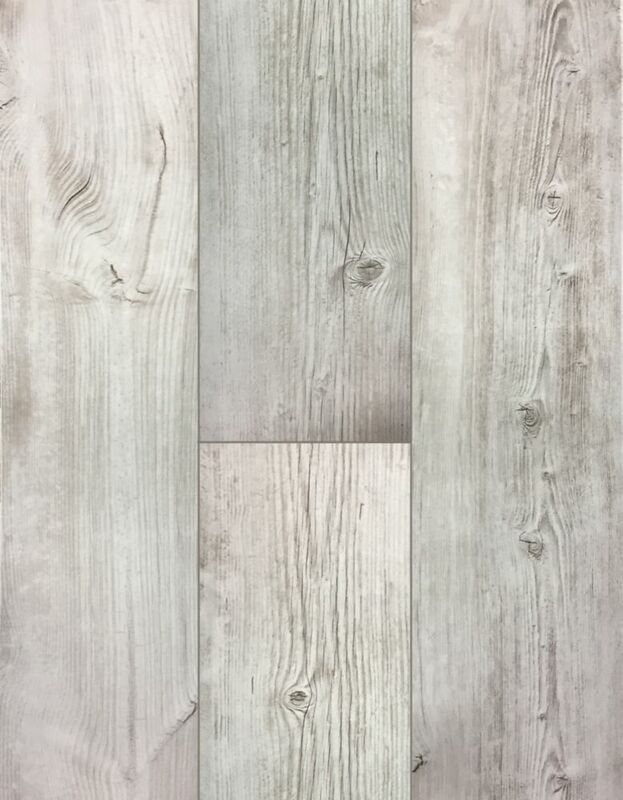 Dovetail Pine 12 mm Thick x8.03-inch Wide x47.61-inch Long Laminate Flooring(15.94sq.ft./case) Dovetail Pine's texturing and light gray coloration achieve the look of real hardwood adding beauty to any room. Its durable AC4 wear layer protects against scratching, fading and staining. Appropriate for residential and commercial use, it features a user-friendly locking technology for a quick and easy installation. Dovetail Pine 12 mm Thick x8.03-inch Wide x47.61-inch Long Laminate Flooring(15.94sq.ft./case) is rated 4.9 out of 5 by 10. Hello Lucy, the product will, for a period of up 1o 24 hours, resist moisture due to mopping and everyday household spills. I hope this was helpful.